We’ve all heard about the dangers of a fast food diet. With its high salt content, copious additives and refined carbohydrates, fast food does nothing positive for your waistline – or your metabolic health. To make matters worse, a study published in the Journal of Nutrition in 2009 correlated fast food consumption with increases in body weight and waist size as well as reductions in HDL-cholesterol, the kind linked with better cardiovascular health. Other research links fast food diets with metabolic syndrome, a major risk factor for heart disease and type 2 diabetes. That fast food is unhealthy isn’t a novel idea, but it turns out eating fast food has an additional drawback, it changes the bacteria that line your intestinal tract and help to keep it healthy. Within the walls of your small intestinal tract are more than 100 trillion tiny microbes that comprise your gut microbiome. Each of us has a unique microbiome that, depending upon its composition, can help or hinder digestion. But the bacteria that make up your microbiome do more than preserve the health of your digestive tract – research suggests these bacteria enhance immune health and can even impact your body weight. Research shows people who are obese have a population of gut bacteria that differs from those who are lean. When obese people undergo gastric bypass surgery, their gut bacteria change too. Also of interest is a case where a woman received a bacterial transplant from the feces of an overweight person. She very quickly became overweight! Gut bacteria may affect body weight in a number of ways – by altering nutrient absorption and by influencing appetite. Gut bacteria are smarter than you think. According to researchers at the University of California at San Francisco, gut bacteria subtly influence our dietary choices in an attempt to get the nutrients they need to survive. One way they do this is by communicating with the vagus nerve, the nerve that connects your gut and brain. It’s your vagus nerve that controls how rapidly your stomach empties after you eat. They may be able to do other sneaky, but clever things, like alter the way you taste foods and release chemicals that make you feel good when you eat a particular food. Pretty spooky, isn’t it? In reality, gut bacteria compositions changes throughout your life in response to the diet you eat as well as environmental factors. But at all ages, a diverse population of gut bacteria is better from a health standpoint. When scientists introduced a diversity of gut bacteria into rats in a study, it positively impacted the function of their immune system. Lack of gut bacteria diversity is a factor in a number of health problems, including obesity and some forms of cancer. For example, a study showed people with less diverse gut bacteria may be at greater risk for colon cancer. What does this have to do with fast food? 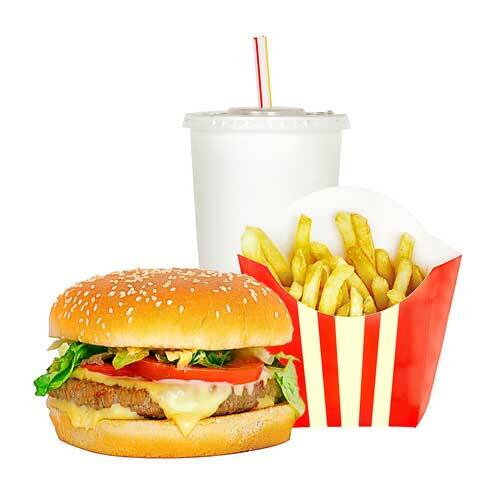 Noshing on a fast food diet may reduce the diversity of gut bacteria in your intestinal tract. In an informal experiment, a genetics researcher at King’s College in London asked his son to eat a diet of nothing but McDonald’s food for 10 days. Throughout the study, he sent stool samples to various labs to have his son’s gut bacteria analyzed. The results were shocking. In 10 days of eating fast food, the son lost 40% of the total bacterial species in his gut, leading to a much less diverse population of gut bacteria. Based on what we know now, this could have widespread health implications. Fortunately, gut bacteria can change quickly in response to dietary changes. How quickly? One study showed in as little as a day. That’s good news! It means it’s never too late to positively impact your health by changing what you eat. So what should you eat to diversify your gut bacteria? Not fast food, of course. Instead, decorate your plate with whole foods and foods that naturally contain gut-friendly bacterial cultures such as fermented foods. Fiber-rich whole foods are a source of prebiotics, food for those hungry, gut-friendly bacteria. Eating foods that contain components you can’t digest but bacteria can promote the growth of friendly gut bacteria. Examples of foods that contain prebiotics include artichokes, lentils, asparagus, bananas, chicory, and raw garlic, to name a few. Help yourself to more fermented foods. Yogurt with active cultures is one example, but you can also seed your intestinal tract with live bacteria cultures by drinking kefir, eating kimchi, munching on spicy Korean cabbage or fresh sauerkraut, and by eating fermented soy foods like tempeh and miso. Most people in Western cultures don’t eat enough of these foods and have a less diverse population of gut bacteria as a result. Interestingly, exercise may increase gut bacteria diversity. A study showed a group of professional rugby players had higher levels of a bacterium associated with healthy body weight in their guts relative to two control groups. This is an exciting area that has yet to be researched – but it’s one more reason to keep on exercising! Now you have another reason not to pull into McDonald’s. Fast food may alter the composition of bacteria in your gut, a change that could have a significant impact on your health and body weight, based on preliminary research. Trade fast food for fiber-rich, whole foods, and fermented foods to diversify your gut microbiome. The influence of your gut bacteria extends far beyond the boundaries of your gut. Show some respect for them. J Nutr. 2009 Nov;139(11):2113-8. doi: 10.3945/jn.109.109520. Epub 2009 Sep 23. Do Food Additives Destroy Healthy Gut Bacteria? Can Exercise Improve the Composition of Your Gut Bacteria? Can Exercise Change Your Gut Microbiome? I didn’t know fast food affected our gut biomes so much! It’s funny – it’s only recently that I’ve heard people talking about how important our guts really are, but the more I read the more important they seem to be. I’m glad you’re helping bring awareness to this topic. Some links to recipes containing pre and pro biotic ingredients would be a great add-on.